Vitamix Professional 300 - Got Greens? Vitamix Professional Series 300 is a next generation performance blender from Vita-mix. 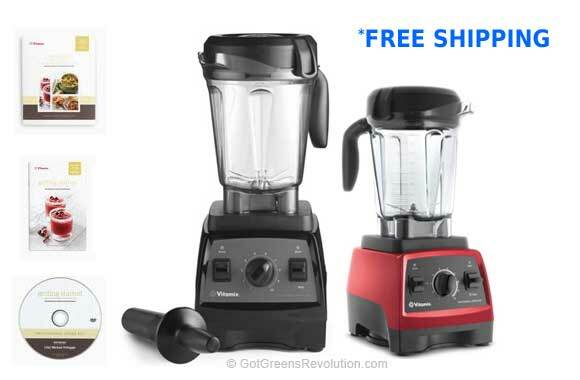 Here you can find the best price Vitamix Pro 300 which includes free shipping. Order from Amazon or from Sur Le Table and for the best price possible. Vita-mix has designed the 300 with a lower, wider shape in order to fit under most kitchen cabinets. It’s new design also results in very efficient, powerful blending. The motor of the Pro 300 has been improved. Like the Vitamix Commercial models, the Professional 300 has a radial cooling fan running at all times the motor is on to keep it cooler. Greater Efficiency – at 1200 watts, this model draws slightly less power than other models yet produces more power than before at 13 amps. The result is a claim is that Vitamix Pro 300 is 40% quieter than previous Vitamix models. The 64 oz BPA-Free container has been redesigned for greater efficiency. It not only is shorter so that you can keep your blender on your counter top, but it is now wider with a larger blade. The best thing about this container is that, unlike most blenders, you can fill this to full capacity for your blending enjoyment. The Vitamix Pro 300 now has precision control. The Variable Speed control has been improved for precision. Each numbered speed on the dial, up to ten, has been finely tuned and calibrated to be consistent. Now there is no need for a Hi switch as the variable speed dial takes the blender to maximum speed. The newly added pulse feature gives you additional control over creating dishes to your precise specifications. Included with your Vitamix Professional 300 blender is a tamper, a Create Recipe book, the Getting Started guide and a tutorial DVD with Chef Michael Voltaggio. Ultimately, the Vitamix Professional Series 300 is an amazing blender. While we love our Vitamix 5200, if you are willing to spend the extra $80, you can take advantage of the latest that Vita-mix has to offer. It will not disappoint.